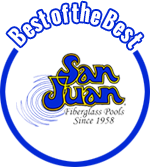 The versatility of San Juan fiberglass pools and spas allows for infinite design possibilties. Here are just a few examples of how San Juan pools can be utilized to create an architectural masterpiece, unmatched in beauty and elegance. Click HERE if you would like to view Pool Models and Pricing.